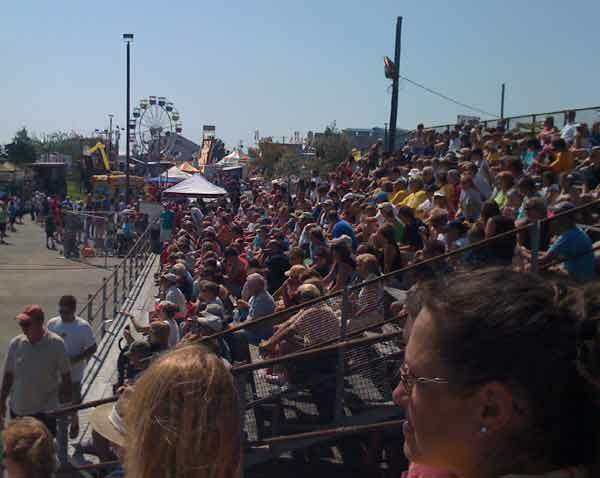 Attend the National Hard Crab Derby at Least Once Before You Die. 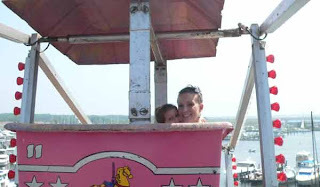 Before I lived 6 miles from Crisfield, I knew about the National Hard Crab Derby. People from all over the Mid Atlantic region flock to the Crab Capital of the World to see some 400 crabs compete in the Governor's Cup Crab Race every Labor Day weekend. The crab race is only a part of the fun. There's the boat docking contest with a $30,000 purse, carnival rides, games, crab-picking contest, parade down Main Street where the newly crowned Miss Crustacean waves to on-lookers, concerts in the evenings, and a fireworks show that rivals any I've seen this side of the Nation's Capitol. 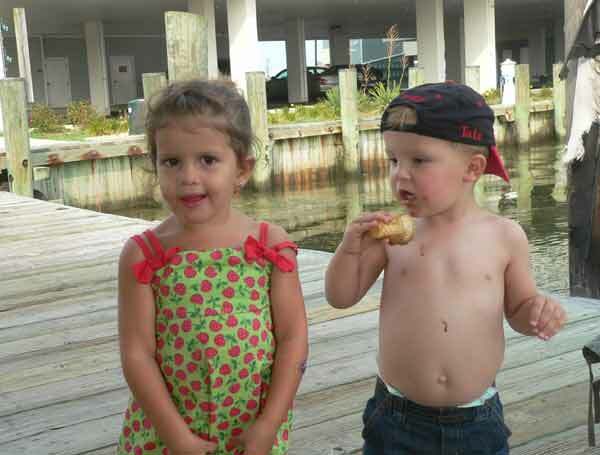 Crisfield, has one of the most undiluted cultures on the east coast. Many inhabitants who live in Maryland's southernmost town can trace their roots back 14 generations. The waterman's culture still hangs thick around the commercial and residential districts that reflect a time when watermen shared yarns in dilapidated shanties and locals could walk to the docks and seafood processing plants to earn their wages. The experience of interacting with these local people, hearing their stories, enjoying their fabulous food and sharing in their local celebrations is a cultural experience unparalleled in Maryland. 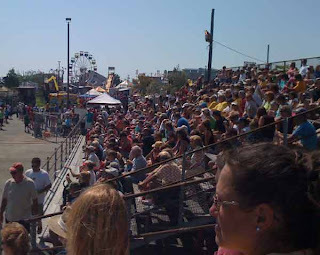 And this festival - the Hard Crab Derby - shares that sense of celebration with over 10,000 visitors. At the turn of the 20th century, Crisfield was a huge port of call on the Chesapeake Bay, and was second only to Baltimore for trade commerce in the state of Maryland. The railroad came straight down to the town dock and picked up carloads of seafood brought into the port of Crisfield. Today that dock is still referred to by locals as "the depot" and it has been transformed into one of the best and largest waterfront public places in Maryland. The Crisfield town dock affords a place for visitors and locals to walk, fish, sit awhile and at an ice-cream cone, watch the boats come and go from Somers Cove Marina (the largest state-owned Marina in Maryland), see the waterman bring in that afternoon's catch, see the herons and gulls swoop and sail over Janes Island, or watch a spectacular Tangier Sound sunset from the 2nd level viewing area. Through the years the town became known for its seafood - in particular the Chesapeake Bay blue crab. 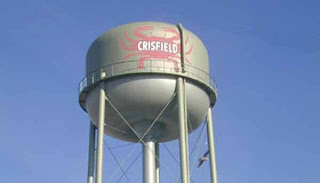 The town dubbed itself the Crab Capital of the World, and its crustacean insignia is everywhere - blazoned on two water towers and every street sign. Businesses like Eddie Heath's Crab Pots and Crustacean Station straddle "the strip" which is the main drag running straight to the depot. As one walks or slowly drives along that strip, water views peep in and out through the store fronts, the crab shedding plant, the restaurants and the condominiums - but the big water view from the town dock is free to anyone who chooses to park and sit. Imagine sitting among a thousand people in stadium bleachers looking down at a stage. In front of that stage is a large wooden platform pitched at a slight angle. At the top of the platform is a rectangular holding area for 50 crabs. Crabs are placed in individual side-by-side compartments like horses at a starting gate. At the start of the race the front panel is lifted, and the imprisoned crabs rush out and scramble down the slanted wooden platform which has been dowsed with water to make it good and slippery. The first crab that scooches off that platform onto the asphalt is the winner of that heat. And there are lots of heats. The race concludes with all the winners of the previous heats clawing (hee hee) their way to the edge of the platform. One strong, perfect blue crab is dubbed that year's winner of the Governor's cup race... a race named for Crisfield's native son, J. Millard Tawes - 54th governor of Maryland and the only person Maryland's history to occupy all three offices of the Board of Public Works - Governor, Treasurer, and Comptroller. What does the owner of the champion crab get? A giant trophy (presented to him or her on stage by Miss Crustacean) and bragging rights for a lifetime. Don't think I can't hear you "not-from-here" folks giggling about the title "Miss Crustacean" Funny as it may sound to outsiders, the title means something around here. It's a descriptive tag that follows a woman for the rest of her life. "Oh, you know Val, down at the Chamber. She's such a dynamic worker ... and you know she's a former Miss Crustacean." I was once introduced to General James Adkins who at the time was Secretary of the Department of Veterans affairs. 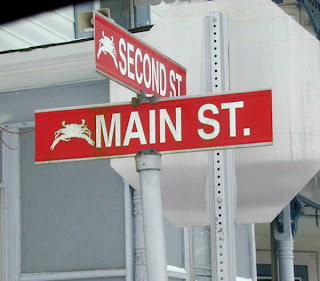 He asked me where I was from and I said Somerset County, to which he replied, "I'm married to a former Miss Crustacean." Wow.... that's when I knew it was a big deal. 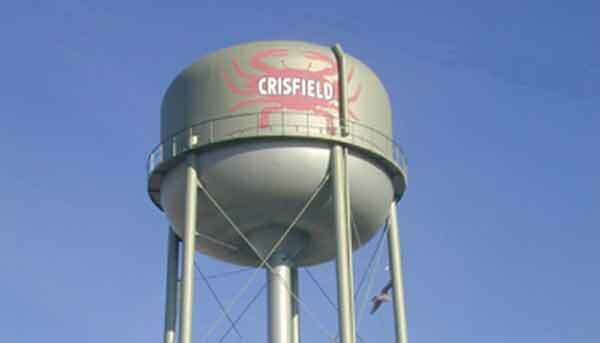 The truth is, I love Crisfield. Though it has some shabby parts left from an economic slump that gripped the town when the water slowed its yield to the waterman, the town has a heart - which is its people - people who continually push the town in an upward direction. This Hard Crab Derby, attracting numbers that are 5 times the town's population with a boat docking purse that exceeds the estimated local household income is a great example of the spirit Crisfielders have, and the talent of some remarkable people who are able accomplish what many towns with higher incomes and greater resources have not been able to pull off. 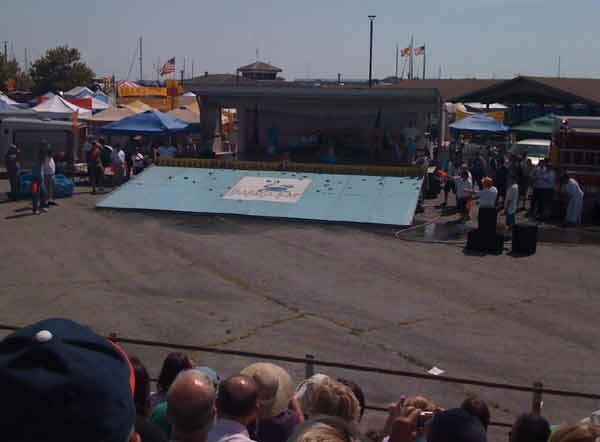 Hard Crab Derby is a fixture in our Labor Day weekend every year. I wouldn't think of being anywhere else. 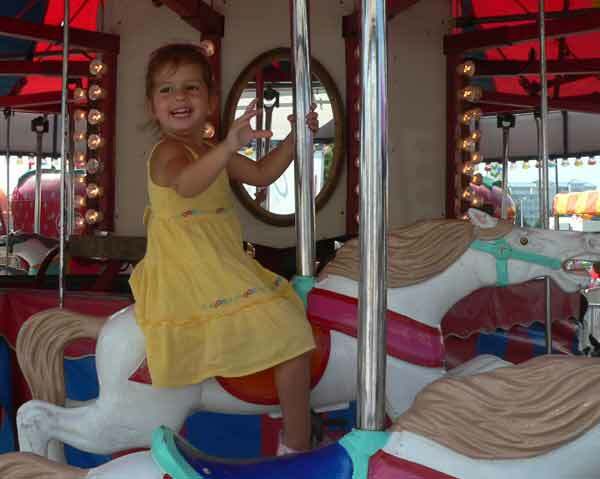 Our kids and grandkids are developing their own memories of Somerset County Labor Days, and the Derby race is something they talk about all year... and yes, we've got a houseful coming in this weekend. We're all looking forward to the activities. 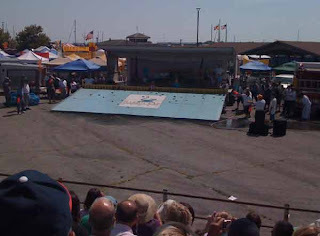 The Hard Crab Derby is an experience everyone should have ... something everyone should do at least once before they die. 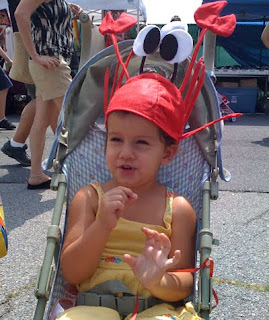 Vacation memories that stick are made at the Crab Derby. It's a festival you feel with all five of your senses. The 63rd Annual National Hard Crab Derby will be held Labor Day weekend with activities Friday through Sunday - Somers Cove Marina in Crisfield. It's free admission. Check the Crisfield Chamber of Commerce website for a Schedule of Events. Don't miss it.